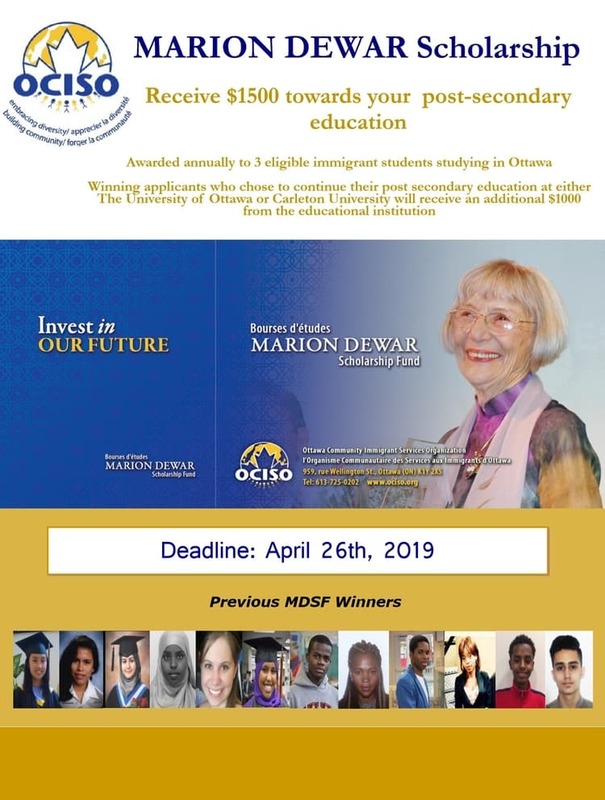 The Marion Dewar Scholarship Fund (MDSF) was established by Ottawa Community Immigrant Services Organization (OCISO) in 2008, in honour of the late Marion Dewar, former Mayor of Ottawa. The goal of the Scholarship Fund is to provide financial support to foster academic and leadership excellence in immigrant and refugee youth. The fund supplements the tuition and supplies required for their post-secondary education in the National Capital Region. Each year, a scholarship of $1500 each will be awarded to 3 immigrant and refugee youth. Ms. Dewar was closely tied to the early years of OCISO. She was instrumental in shaping the immigrant and refugee policy for the City of Ottawa. In 1979, Ms. Dewar led the city in a bold test of collective action with Project 4000. Residents of Ottawa joined together to sponsor 4,000 Vietnamese, Cambodian and Laotian refugees , offering them the opportunity of a new life in Ottawa. Project 4000 earned Canada international recognition from the United Nations. These Southeast Asian refugees were among OCISO’s first clients. Over the next 10 years, Ottawa can anticipate receiving between 6,000 and 8,000 immigrants per year. Approximately 18 % of Ottawa’s youth aged 18-24 are immigrants. Many of these youth will have serious challenges in reaching their academic and leadership potential because of their parents’ inability to support their children’s dreams. Research indicates that immigrants are disproportionately affected by poverty – 49 percent live with low income. Immigrant children and youth are more likely to live in lower-income household than Canadians (CCSD, 2000). These economic challenges related to immigrant parental unemployment and underemployment constitutes serious financial obstacles for immigrant and refugee youth’s ability to have full and equitable access to higher education. Ensuring that these youth receive an opportunity to reach their full potential and helping to build a strong, caring, and inclusive community is our collective responsibility. Marion championed the cause of refugees, immigrants and all those who struggle for better lives. Now it’s our turn to make a difference. Make a lasting positive change in the life of immigrant and refugee youth through education. Every dollar counts!